Race winner Niel Allen (McLaren M10B). Niel Allen, Frank Matich, Teddy Pilette, Kevin Bartlett, Malcolm Guthrie and Leo Geoghegan denied New Zealanders Tasman points by finishing in that order in Invercargill's Teretonga International on 24 January. Allen set 97.875 mph race and 100.95 mph lap records. 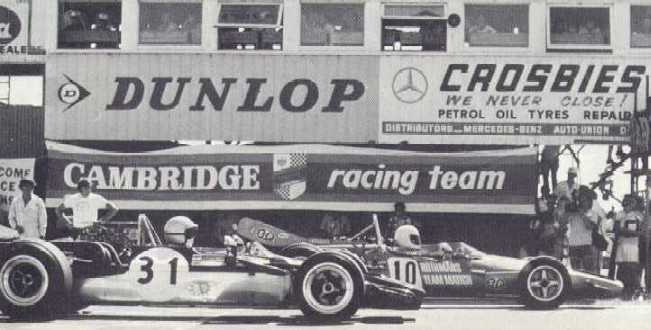 His McLaren M10B Chev ran third from the start, second when leader Matich spun in lap 13 and first when Frank Gardner's Lola T192 Chev lost oil pressure in lap 19. Gardner was holding second place when his engine expired after 50 of the 62 laps, by which time Matich had recovered to take over the vacated position. 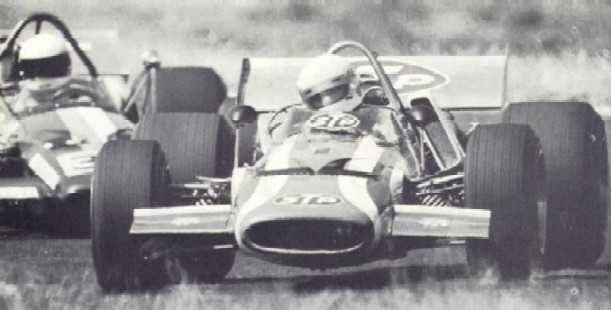 John Cannon (McLaren M10B Chev) looked a likely third place prospect after Matich's demotion, till a half-shaft broke in lap 16. Pilette (McLaren M10B Chev) and Bartlett (Mildren-Chev) see-sawed, but the Belgian gained final advantage when the Australian spun in lap 55. Guthrie (Lola T192 Chev) took sixth place when Graeme Lawrence had a piston break in lap 49 and was elevated to fifth when Gardner retired. He was two laps down at the finish, still one ahead of Geoghegan (Lotus 59 Waggott), who profited when David Oxton (March 701 2.5 Cosworth-Ford V8) lost second and fourth gears. Graham McRae (McLaren M10B Chev) did not figure, lack of oil pressure sidelining him after four laps. Allen improved on the 1969 race time of Piers Courage (Brabham BT26 2.5 Cosworth-Ford V8) by 17 sec and his record lap was 1.385 mph quicker than that of McRae (McLaren M10A Chev) and Jochen Rindt (Lotus.49B 2.5 Cosworth-Ford V8). Amon missed the race, as he was away in Buenos Aires winning the non-championship Argentine F1 Grand Prix for Matra-Simca. The start with Matich (McLaren M10B) just heading Gardner (Lola T192). Drivers had two days to familiarise themselves with the world's southernmost circuit before Saturday qualifying trials. Allen and Pilette gave notice of things to come on the first day when they were credited with sub-record laps by unofficial watches. They did not appear on the second day, when McRae, Matich and Gardner returned times of 57 sec, 57.3 and 57.6 respectively, to break the 100 mph barrier. Lawrence, the Ferrari losing ground on the main straight, made 58.2 sec. Early on pre-race day Gardner returned 56.3 sec (102.5 mph), a figure he could not improve upon. In the second session Allen equaled Gardner's time. McRae made 57.1 sec, had another try and broke the crankshaft of his only Chevy engine. Competition was really keen and before the final session ended Cannon, Pilette and Bartlett had all returned 57 sec, while Geoghegan, Lawrence, Oxton and Mike Eyerly (Surtees TS8 Chev) had posted 57.6 sec. A last desperate bid by Matich clinched pole position. He returned 56 sec for a lap average of 102.94 mph. Minutes later Bob Brown (Lola T190 Chev) knocked two wheels awry when they touched the pit lane safety barrier as he was about to try to improve on 58 sec. With the exception of Brown, there were no defaulters when the field came out for the warm-up lap. McRae had borrowed an engine from Pilette and took his place outside his benefactor in the third row. There was some consternation when poleman Matich stopped by his pit at the end of the warm-up for ride height adjustments, but he was in place for the rolling start and he made the most of it to lead Gardner, Allen, Cannon, Pilette, Bartlett and McRae into the Loop. This was the order at the end of the first lap, with Lawrence, Oxton, Geoghegan and Guthrie next. Don O'Sullivan pitted to have the nose of his McLaren M10A Repco taped back in place after meeting a solid object, probably Guthrie's T192. At the end of three laps McRae had drifted from seventh to twelfth place and a lap later he abandoned with a broken engine. Gardner was running 1 sec behind Matich and just clear of Allen and Cannon. Not far behind were Pilette, Bartlett, Lawrence, Eyerly and Guthrie, well bunched; then came Oxton, Radisich and Geoghegan. After ten laps only 4 sec covered Matich, Gardner, Allen, Cannon and Pilette and they had all lapped Geoff Mardon (Begg FM4 Chev) who had only O'Sullivan behind him. Two laps later Eyerly made a short stop for a throttle-cable adjustment and in the next round Matich had a big spin that dropped him back to fifth and cost him 8.2 sec. 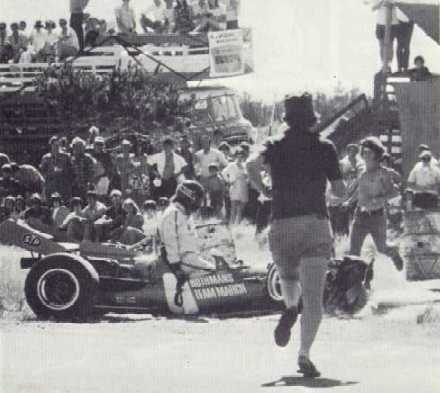 Don O'Sullivan (McLaren) extracting himself after a crash. 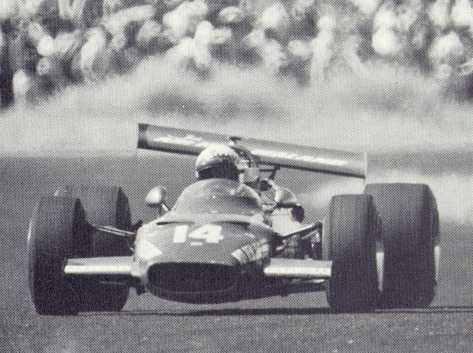 Cannon coasted to the outside of the track at the Elbow, with a broken half-shaft, as Gardner, Allen, Pilette, Matich and Bartlett completed lap 15 and, at that stage, the length of the straight separated this group from Lawrence, Guthrie, Oxton, Geoghegan, Radisich and Evan Noyes (Brabham BT29 FVC). Ominous wisps of smoke began to emerge from Gardner's engine and Allen moved his M10B in on the T192. In lap 19, with oil spraying on to a rear tyre, Gardner ran wide in a turn and Allen slipped through to the lead he was not to relinquish. Even so only 7.8 sec bridged Allen, Gardner and Pilette. Matich was moving in on the Belgian and was clear of Bartlett who, in turn, was clear of Lawrence and the rest. By the end of lap 22 Matich had taken Pilette and was 6 sec behind Gardner, who was hanging on grimly in an ailing car. Allen was pulling away fractionally each lap and by the end of lap 34 was 6 sec ahead of Gardner, who held a 7 sec margin over Matich. Bartlett had gathered in Pilette, but did not manage to take him until lap 38. With 40 laps completed Allen had 7 sec over Gardner and still Matich was unable to improve. Behind him Bartlett held a slender lead over Pilette and then came Lawrence, Guthrie, Oxton, Geoghegan and Radisich. Nine laps later smoke began to billow from Gardner's T192 and about the same time Lawrence coasted the Ferrari to the grass on the main straight, with a rare engine failure, when a piston broke. Graeme Lawrence (Ferrari) with a loose wing. Gardner limped into the pits, just failing to complete 50 laps, to let Matich into second place 15.8 sec behind Allen. Bartlett and Pilette followed Matich with Guthrie next, and Geoghegan ahead of Oxton who was struggling with two inoperative gears in the March. Allen had things all his own way and the only change before the finish resulted from a Bartlett spin in lap 55. This misadventure let Pilette assume a 1 sec lead over Bartlett which he was able to improve before Allen took the flag that signaled the finish of the New Zealand section of the Tasman Championship. Fastest lap: N Allen, 57.1 sec (Record).